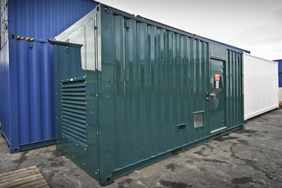 Now shipped is this 65kVA generator with a built in retention bund tray, louvres and silencer. The system was despatched to a water management site in Leicestershire and will be operating in a plant room. Our first 6 bays in the factory are currently very busy. Each bay has a custom designed enclosure in it. These steel enclosures will eventually be used to house generators and switched electrical distribution units. All the enclosures shown here are for repeat orders from satisfied customers. 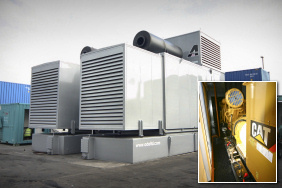 2 Identical 800kVA generators, housed in bespoke acoustic enclosures ship to Gatwick Airport. Emergency lighting is essential in large public buildings such as shopping centres or stadiums. If there is a power failure in a crowded building there has to be some way of lighting the exits and walkways, to ensure people can find their way out safely. 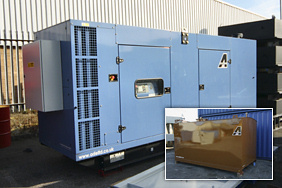 This Cummins 110kVA generator will be providing stand by power for a shopping centre in Nottinghamshire, England. The second batch of switchgear enclosures for a solar farm project are shipped. Three units were shipped in this batch. 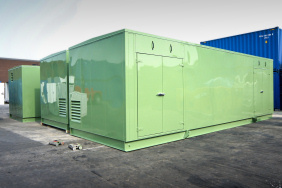 This acoustic enclosure was built to house a generator which will be powering critical systems at a UK air traffic control centre. 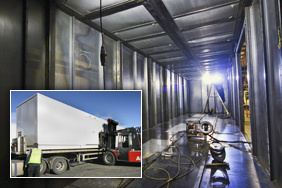 The noise rating was specified by the client to reach no more than 75dB(A) at one metre. The enclosure comfortably met the requirements. 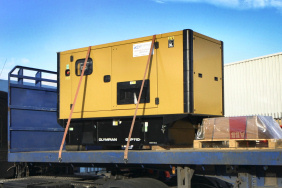 A standard Cummins C275 enclosed generator is shipped to West Africa to provide auxiliary power for a mining operation. This is a repeat order from one of our regular clients. Another standard Cummins generator, this time a C250, is shipped to Ho Chi Minh City (formerly Saigon) in Vietnam. 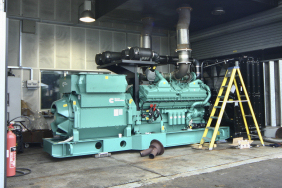 This generator will be providing emergency backup power for a manufacturing plant. 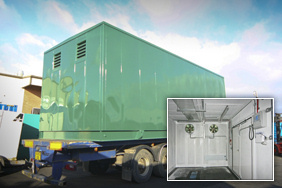 The first three of fifteen specially designed switchgear enclosures are shipped from ADE. All these enclosures will be used as power distribution hubs for a solar farm project. 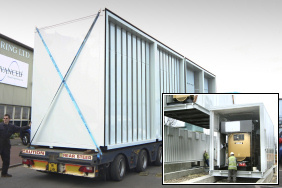 For a regular client this repeat build 40ft container, complete with an integral 2,000ltr tank was designed and built in only 4 weeks for installation at a UK location. 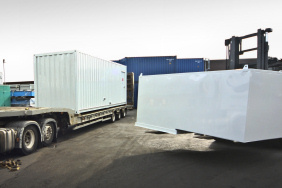 This is our second 30ft Acoustic container to be despatched for a project which will provide power for a major supermarket chain. 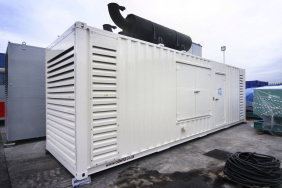 This container was designed to achieve 85dBA@1m when fitted with a free issue 1mVA prime powered generator. 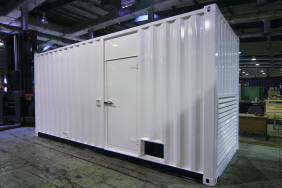 An acoustic 40ft container, for a mine in Africa, is part of our high power design range. 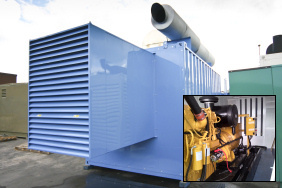 By installing the 50deg radiator horizontally, we were able to fit both the radiator and 2mVA generator within a standard 40ft high cube ISO. See below item for fuel system solution. 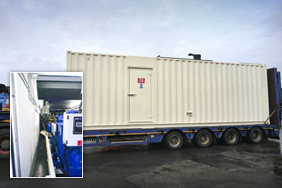 The above plant was complemented by a 26,000 litre bulk fuel tank housed within a separate 20ft enclosure. 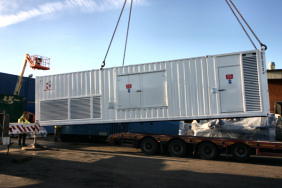 Innovative design made this power plant ideal for straightforward shipment to its final destination in Africa. 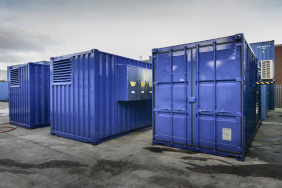 When onsite, the containerised solution will allow for easy positioning and apertures in the container ensure trouble-free pipe work connection. 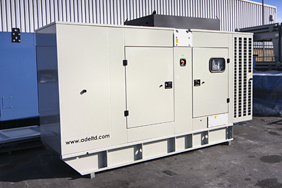 A standard Olympian 165kVA enclosed generator fitted with an additional bund tray. This is a repeat order for a customer based in Wales. 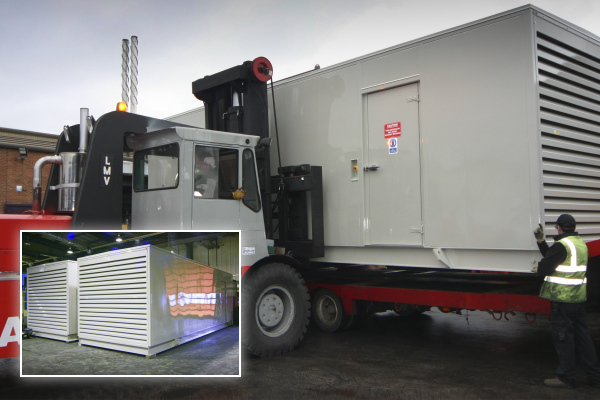 0This bespoke preassembled unit designed by ADE was built for a MWM TCG2016V12 600kWe generator to fit into a unique underground location for a major energy provider. Installation required removal of the roof for access and everything craned into position. The equipment was shipped to site in three units to be reassembled in situ. 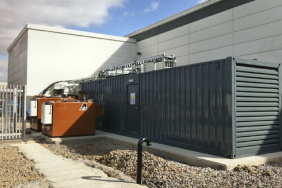 A telecomms company offering the new 4G network required a 900kVA generator for their new site in South Yorkshire. 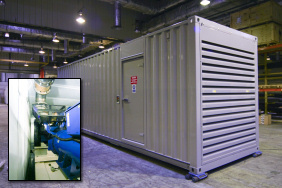 The generator system is housed in a 30ft acoustic container and includes a 2,000 litre day tank inside the container (see news item below). Three x 12,000 litre fuel tanks are supplied as part of the telecomms installation (above). 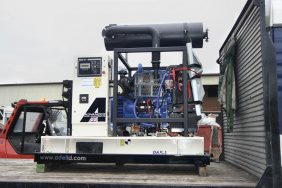 Three complete systems including fuel polishers, gauges and pumps were supplied in a single unit. This allows the use of any one tank should any part of the system fail or be under maintenance at the time of operation. Another repeat order for a 40' switchgear enclosure is shipped to one of our clients. This unit was shipped empty and will have all relevant switch panels fitted on site. 17 x ADE designed and manufactured custom ATS panels are supplied to a large communications company as part of their generator support system upgrade. 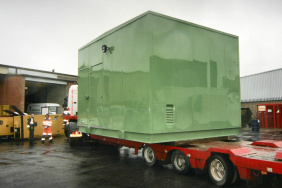 A 5,000 litre fuel tank is supplied as part of the generator support system upgrade for a large communications company. (see above item). A 2,000 litre fuel tank is supplied, again as part of the generator support system upgrade for a large communications company. All necessary civil works were completed by ADE before we delivered, installed and commissioned this fuel tank for a UK rail network operator. 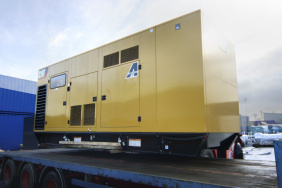 This standard Olympian GEP400 generator was supplied to a UK building services company. Shipped with the generator were three 40 amp changeover panels and a first fill of fuel. 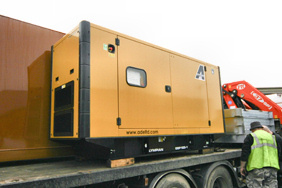 Two stock Olympian GEP50 Enclosed generators are modified to hold 900 litres of fuel. 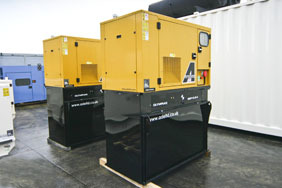 The generators were also supplied with custom 32 amp sockets. 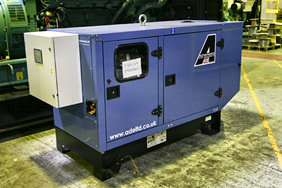 A stock Olympian GEP110 Enclosed generator this set has been supplied complete with an ATS Panel. 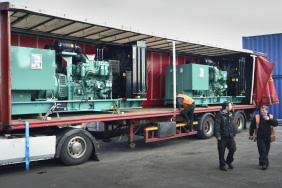 A multi order of standard Olympian and FG Wilson enclosed generators to be exported, the despatch included 2 of each Olympian GEH275 and GEP110 generators and a further 10 FG Wilson P22 sets. A 30 foot (9m) ISO container is modified, installed with Perkins 4008TAG2a and provide a Noise rating of 85dBA @ 1 meter for a Main Stream Supermarket Chain. This is the first of 2 sets to be supplied for this project. 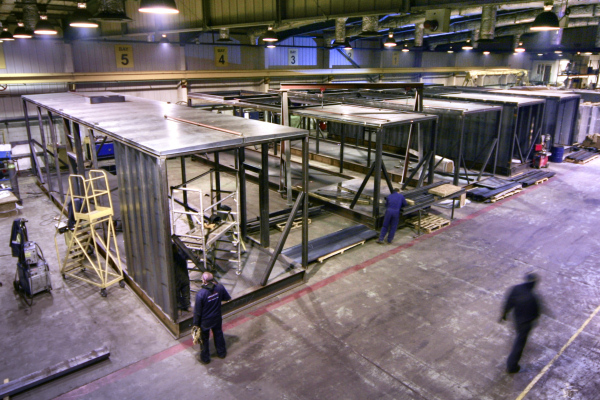 The fourth Switchgear enclosure of an order for four, this 13.5m long canopy is shown in fabrication. We are now working on the next set of projects for this customer. 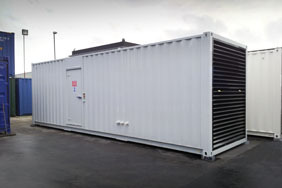 A 40 foot (12m) ISO container is modified, installed with Perkins 4012-46TWG2A and provides a noise rating of 85dBA @ 1 meter for a mainstream supermarket chain. 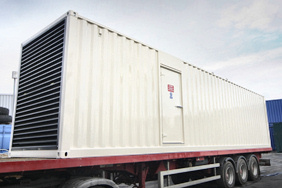 A standard enclosed Olympian GEP165 genset, part of the project below. (HMP). This Fuel tank is part of an installation package with Genset and associated Attenuation and Plant Room equipment installed as part of an HMP Prison, standby power installation. This bespoke build canopy has been designed for a MWM TCG2020V16 11kV generator and has roof mounted Radiators, silencer system and walkways. A large energy provider based in Ireland free issued the engine to ADE and will be delivering the system to a UK water authority. This design has now been added to our standard build portfolio. The third switchgear canopy out of an order of four being 5 meters in length. 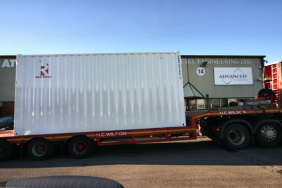 Ready for despatch is 20ft modified ADE Standard Powerbox, this houses a FG Wilson P65 Genset. The enclosure is built to a noise rating of 75dBA @ 1 meter for this set also has a 2,000 litre tank to feed the set, making it a self contained unit. A standard Cummins C175 generator is repainted in Agate Grey. 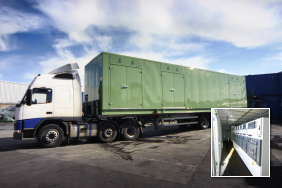 The unit is now on site at a Biogas company, providing standby power for critical systems. 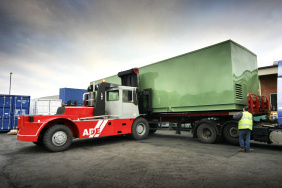 Number two of an order for four switchgear containers leaves ADE. The very casual looking team behind a project involving multiple medium sized generators for a British telecoms company. 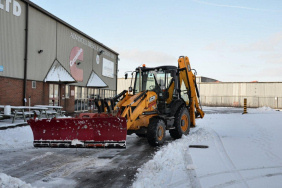 Pictured in the ADE yard, these units have just returned from a test centre where they were exposed and tested under sub zero conditions, to ensure opearation on site in various weather conditions. 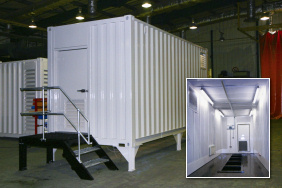 A 40 foot (12m) ISO container is modified, shot blasted and painted to WIMES specification. 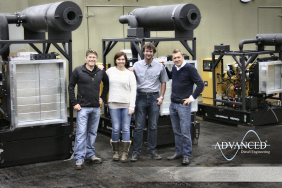 A large energy provider based in Ireland free issued the engine to ADE and will be delivering the system to a UK water authority. 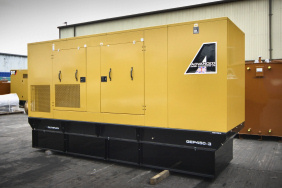 330kVA Cummins generator for military application. Supplied with a 10,000 litre cylindrical fuel tank. The unit was also fitted with a custom ATS panel. 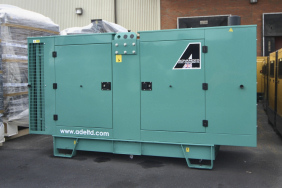 A standard enclosed Volvo powered generator is fitted with a custom ATS panel and supplied with an ADE 'compact type' 7 day bulk fuel tank. 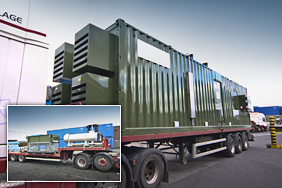 This system will be used for fire training exercises in Northumbria. 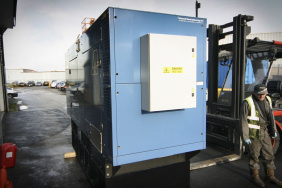 A Mitsubishi powered, single phase, 25kVA generator is sold to a private residence. 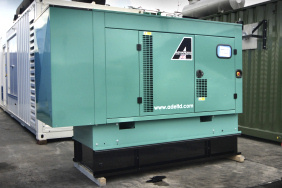 The generator has been fitted with a custom ATS panel and will be used to provide power for security systems and standby power in case of a power cut. 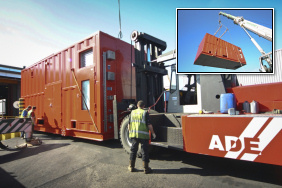 Another 30ft switchgear container leaves the ADE factory. Twin fans, security system, flourescent lighting and building management system were all included in this build for a UK switchgear company. 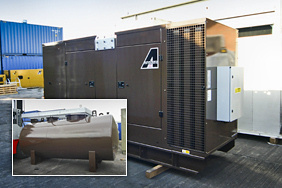 A standard 175kVA Cummins powered generator is given a coat of grey paint, as per the customers specification. This gen-set was also supplied with a 7 day fuel tank. This fully welded steel bunded fuel tank was supplied to an existing customer to provide added autonomy to a generator purchased from ADE last year. 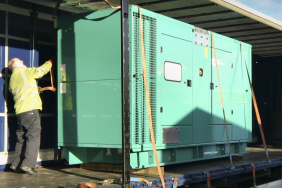 Providing standby power with 8 hours autonomy, this 1250kVA generator is now on site at a UK ASDA store. The enclosure is noise rated at 80dB(A) @ one metre. 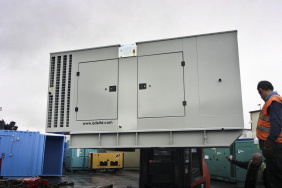 A free issued Perkins 4008 series, 1000kVA generator is installed in a purpose built enclosure by ADE Ltd. 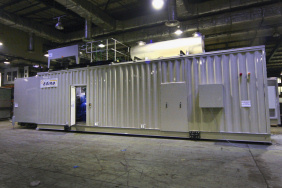 The enclosure is constructed using a modified ISO shipping container. To keep the footprint to a minimum, due to on site requirements, the air inlet and outlet are positioned on the roof. 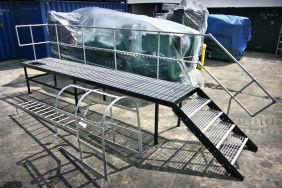 (Inlet shown on fork truck). 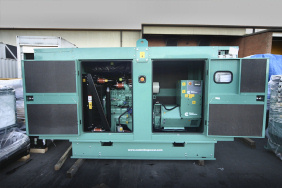 The first eight of sixteen, 900kVA Cummins powered generators in sound proof enclosures. Shown here on load test at the ADE factory. 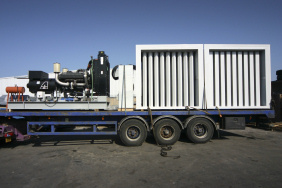 These generators (along with the remaining 8 in the workshop) will be shipped to the Netherlands in September. Enclosure built to noise specification of 75dba @1 meter. 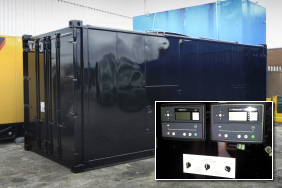 The enclosure is fitted with a free issued Perkins 800kVA gen-set. Delivered to Crosshouse Hospital for stand by duty. Two of a total of four enclosures for a high profile European switchgear company. 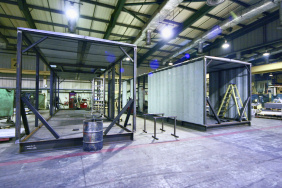 Shown here in the early stages of construction at the ADE factory. A forty foot ISO container returns to ADE following a full shot blast. 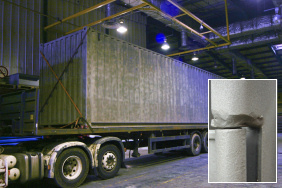 The container was shot blasted to help the paint adhere to the surface, giving the paint finish a much longer life span. The world famous Paul Blything has been appointed as ADE International Sales manager. Paul has a wealth of knowledge and experience in the field and will undoubtedly be a great asset. We look forward to sitting on our hands whilst Paul brings in all the new work! 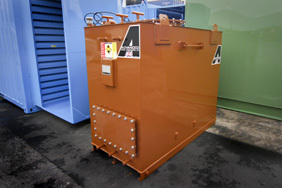 ADE have fulfilled an order for 75 bulk fuel storage tanks and wall mounted ATS panels. The tank capacities ranged from 3,000 to 45,000 litres. This large order has been completed in less than six months of the order being placed. 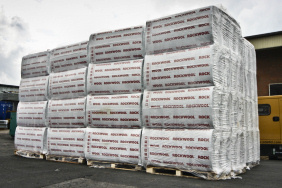 Part of a large delivery of Rock Wool, used in the silencing of our generator systems. Hopefully this delivery will see us through the day. A standard Cummins C150 has been modified by ADE and now features an 18 hour local fuel tank. 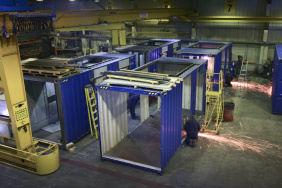 Four of eight 20 foot containers in the first stages of fabrication. 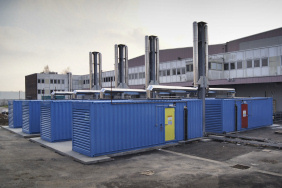 These containers will house Cummins 900kVA generators and are for a Data Centre in the Netherlands. A 2250 shown prepared for load testing at our factory test facility. 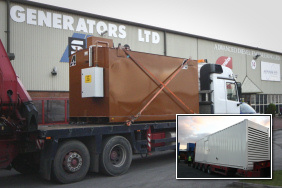 This generator is one of three Cummins 2250kVA units to be sent to Bristol Royal Infirmary, they will be despatched along with three bulk fuel storage tanks. 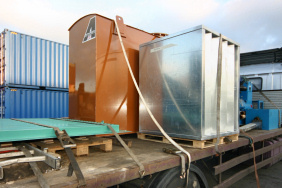 An existing client supplied us with a generator container in need of some TLC. 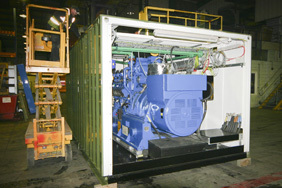 We refurbished the container and installed a new Olympian GEP550 generator. 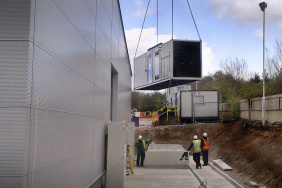 This unit will be providing stand by power for a UK data centre. Another generator refurb. Initially, this unit was sanded back and resprayed on the exterior. We also installed two new Deep Sea control units to give greater control over the twin generators installed in the enclosure. 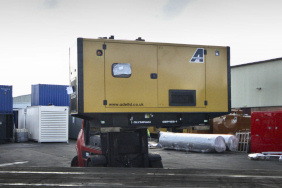 This unit belongs to a large UK generator hire company. Another Olympian generator is shipped. This 88kVA stand by unit is on route to a farm in South Wales. 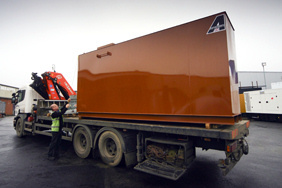 A 10,000 litre bunded fuel tank is shipped to a UK Police authority for their existing stand by generator installation. Three enclosures ready to ship, specifically designed for a large European HV transformer and switchgear company. Provided to a UK pharmeceutical company based near London, for stand by operation in case of a power failure. 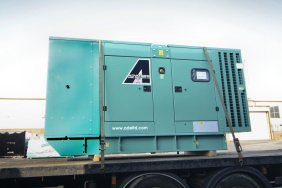 20 Olympian generators are supplied to a reseller in North Africa. 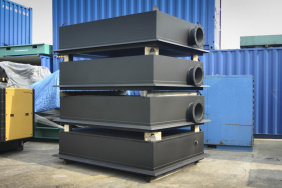 Four new box type exhaust systems are built in preparation for a large upcoming container project. 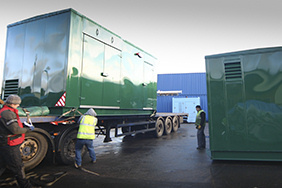 A 1650kVA generator installation at a UK Data Centre. 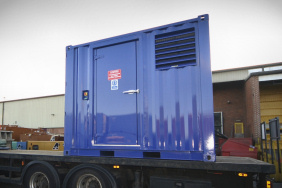 This 1250kVA stand by generator includes an 8 Hour Fuel Tank, an acoustic container rated at 80dBA @ 1mtr and G59 control and protection for mains short term synchronising, with no break return. 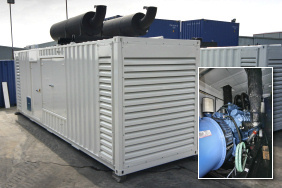 Containerised MTU 1250kVA stand by generator. 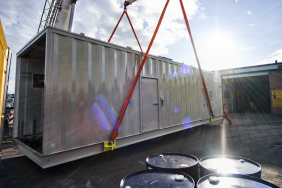 This containerised system will be shipped with an 11,000 litre 'belly' fuel tank. A galvanised steel walkway awaits delivery to a Data centre site. 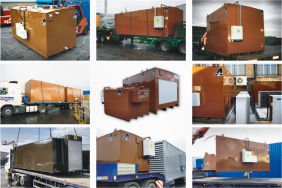 Our diverse product range serves as a reminder that ADE are much more than your average generator company. The walkway is part of a multi-stage project which includes generators, fuel tanks and UPS systems. 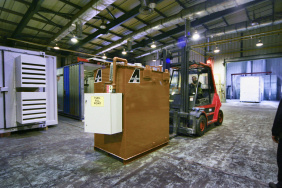 The first of three custom fabricated enclosures leaves the ADE factory.These enclosures are built to house free issued electrical distribution equipment. Another pump housing for a free issued CAT engine. This is the second pump station for the South China Seas oil rig project. 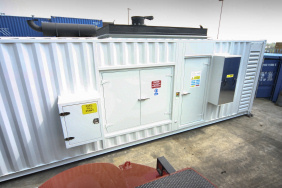 A converted 20' ISO container, designed specifically to accommodate a bespoke switchgear panel arrangement. Included in the build were: internal lighting, RCD protected 13 AMP sockets, electric heater and a 4 way consumer unit. Two Cummins 1100kVA stand by generators are delivered to ADE for the modifcation of the control panels, breakers and engine management systems. 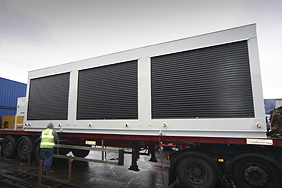 They are to be utilised in a plant room and will be providing emergency power for a UK hospital. 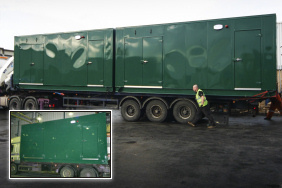 These three John Deere powered generators are loaded onto a lorry and delivered to a UK based generator dealer. A pump housing for a free issued CAT engine. This pump station (1 of 2) will be situated on a drilling platform destined for the South China seas. It will be used in emergency conditions only and is unrestrained. The engine will continue to pump sea water at full power, onto the rig, in the event of a fire. 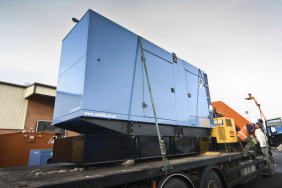 A Police authority based in the north of England has just taken delivery of this 650kVA MTU generator. 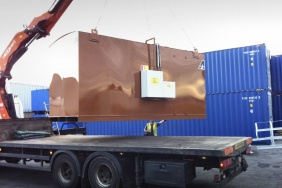 Shipped with the generator were air inlet/outlet attenuators, a 24,000 litre bulk fuel tank, custom controls and various fire protection equipment. 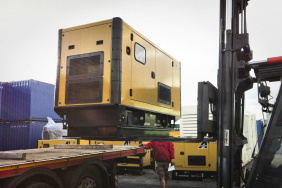 Two more CAT 2250kVA Ultra-Silenced generators for use as a stand by power system for a UK Data Centre. main: Noise attenuators leaving ADE factory. 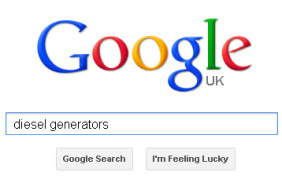 inset: Generators positioned on site. 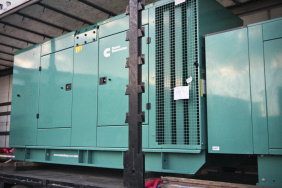 Two Ultra-Silenced Caterpillar generators for use as stand by power systems at a large UK supermarket site. 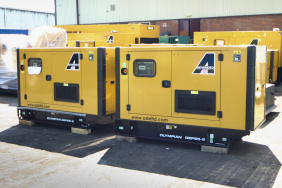 These generators are housed in custom built enclosures with a combined noise level of less than 70dBA when running at 100% load output. 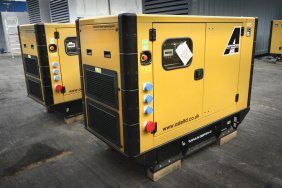 Each generator is situated on top of it's own 13,000 litre fuel tank. A 3000 litre fuel tank, a noise attenuator and a weather louvre are loaded ready for delivery. 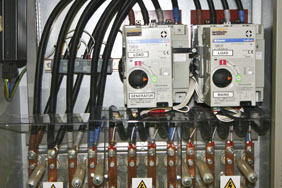 These items were utilised in a generator plant room upgrade at a hospital. 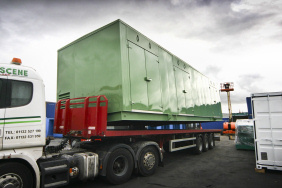 Two acoustically treated generators (1 x 700kVA and 1 x 1100kVA) are delivered to site along with fuel tanks, cabling and pipe work. This project involved the supply and installation of a stand by power solution for a Data Centre owned by a large UK supermarket chain. 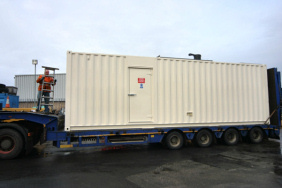 A Perkins 65kVA stand by generator is supplied in this 10ft container. A John Deere 110kVA stand by rated generator. Supplied to a UK control panel manufacturer. 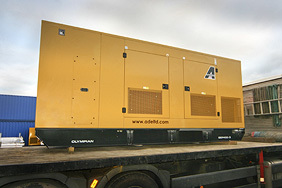 Cummins C1100 and C1400 generators supplied to a large UK utility company. Each generator was supplied and fitted with a 32A, three phase 5 pin, 400V socket and 3 x 16A, single phase 3 pin 240V sockets. All sockets were supplied with individual circuit breaker protection. 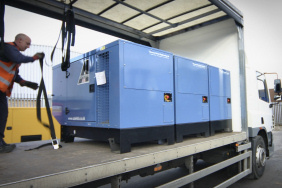 These generators were supplied to a Yorkshire based Environmental Engineering company. A Volvo TAD941GE water cooled diesel generator with an extended (1200L) fuel tank is despatched to a UK based Golf Club manufacturer. 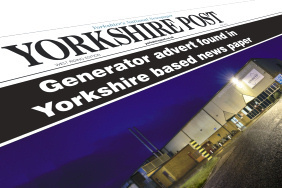 ADE kicks off the 2012 advertising campaign by putting generator offers in the Yorkshire Post. The ADE advert issue is out on Thursday 1st March. 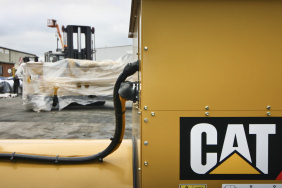 Two CAT generators are delivered to ADE. 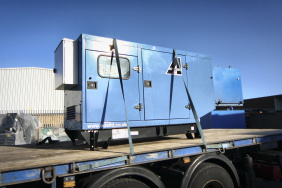 These generators are to be installed in acoustic containers for an Edinburgh based generator company. The end user is an IT support company. 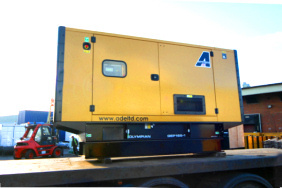 Another 900kVA CAT generator leaves ADE. This canopied set was purchased by a generator reseller. ADE receives yet another order from one of our most prestigious clients. 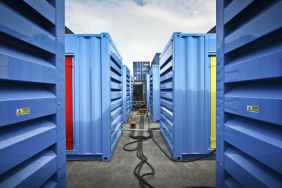 A further six 2250kVA sets are being containerised and will join the fourteen already on site powering an African gold mine. 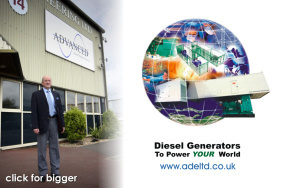 www.adeltd.co.uk (the ADE website) has taken number one position on Google search in the UK for the search term Diesel Generators. A 400kva enclosed CAT set shown ready for shipping, complete with an extended base fuel tank (manufactured by ade) is now on its way to a deaf school in Wales. 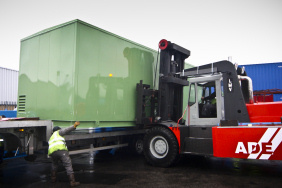 The 67th bulk fuel tank (from a total of 75) leaves the factory for a UK hospital. 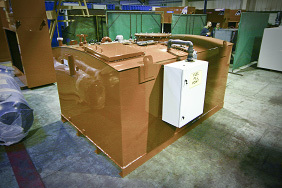 We have now completed 67 of these fuel tanks and delivered them to site in less than 3 months. Ce générateur de système complexe, construit par Advanced Diesel Engineering, est désormais pleinement opérationnel après la comissioning finale à Paris, France. This complex generator system, built by Advanced Diesel Engineering, is now fully operational after the final comissioning in Paris, France. 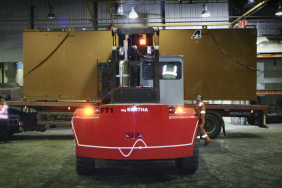 The first of three gas generator containers is shown here almost complete in the ADE factory. 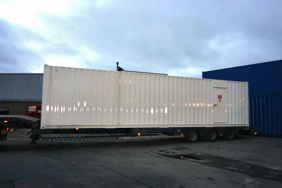 Another ADE designed and engineered bespoke acoustic container. This MTU based generator system has an 8 hour fuel tank, load cable junction panel and is noise rated to 80dB(A) at one metre. 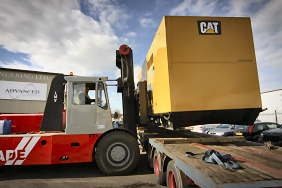 A 900kVA CAT generator is shown here being loaded, ready for delivery to a UK based generator dealer and hire company. 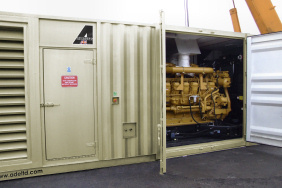 We were free issued with a 500kVA generator, shown here pre-delivery, in a new ADE designed and built acoustic container. 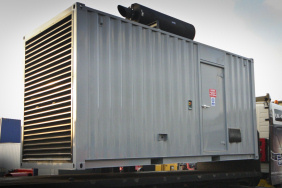 Fitted with a custom fuel tank (700 litres) under the generator and supplied with an externally mounted 400A changeover panel, this generator system is now on site providing power for a large UK based dairy company. 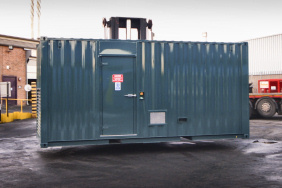 A custom designed new build container for a major switchgear company. Various equipment was fitted by ADE, including switch disconnector and LV electrical fittings. 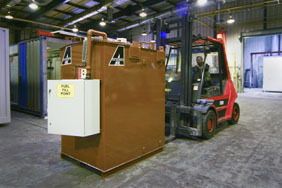 A 150kVA Perkins generator is packaged following a PDI and is shown in the ADE Power Box ready to be sent to the customer. 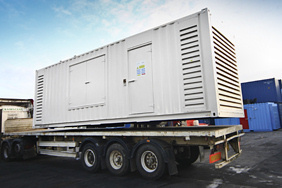 A 900kVA Cummins generator is containerised by ADE and is shipped with a custom ADE fuel tank providing 75 hours autonomy. 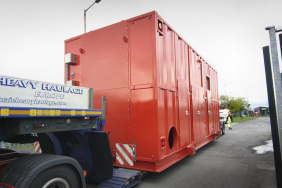 This system was designed and manufactured for a large UK based utilities company. 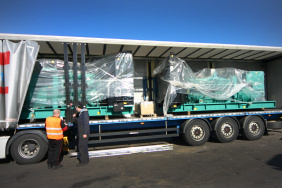 Two standard gen-sets (a 275kVA and a 150kVA unit) are shown loaded for delivery to the UK Police for use as emergency stand by generators. 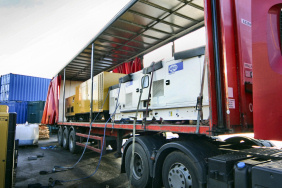 A 165kVA CAT Olympian generator is loaded for delivery to an environmental and engineering services company based in Wales.